Friends stopped by for a stay. I have a place to park, with 50A electric connection. 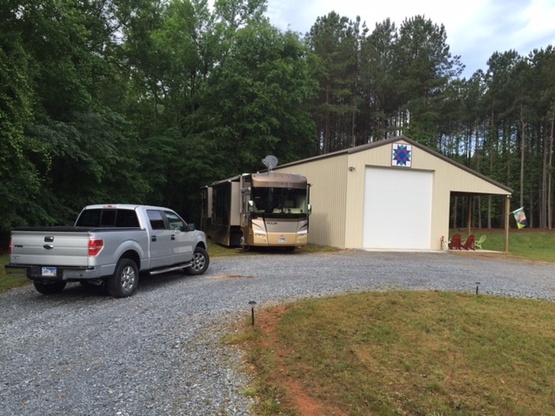 It is a rural setting and is on gravel or grass adjacent to the barn where my motorhome is stored. A water source is available for tank fill, but not for hookup. Rural setting. Paved country roads...I do have a turn-around at the parking location, once you're on the property. Plenty of room….could probably get 5 or 6 units parked, but there is only one electric hookup. We travel frequently, so touching base would be a good idea. Most likely be gone during most of January and part of February…. Earl Scruggs Museum.... Don Gibson Theater.... Local BBQ is excellent... Gardner Webb University is close by... 50 miles to the Blue Ridge Parkway. In August the American Legion World Series is played in our town. Charlotte Motor Speedway, Billy Graham Library, Lake Lure, BMW plant (terrific tour) are all about an hour away. Freightliner service center in Gaffney, SC is 15 minutes away. This couple are wonderful hosts. They provided a quiet place to park our RV, out of the hustle and bustle of a large city. We arrived mid afternoon and enjoyed our visit with the host. The next day we had a leisurely morning and left just after lunch. We will definitely make reservations at this boondocking site when back in the area. Tcamperman was a great host. The location is great. We were provided information on things to see and do in town. Our next location cancelled us but Tcamperman provided us the opportunity to stay an additional day without hesitation. Thanks for the hospitality! I needed to just have some quiet time to decompress ... this host was very accommodating for me. Very nice. You won’t find nicer people anywhere. Tom and Dorothy treated us like family as soon as we got there. I offered to help with anything they needed, and Tom said, we don’t need anything but what can we do for you. We would never drive through NC without stopping by to see these two wonderful people. We feel lucky to have met them. We stayed in late April 2018. Great location for stopping and doing day trips with our motorcycle . Tom has great ideas for bike rides, and eating places. Dorthy is sweet and fun to talk with. We enjoyed learning about their motor home travels and experiences. When we first arrived we missed their driveway and Tom was very quick to come out and redirect us back to their place. We will be back. Theres more bike roads to explore and more stories to hear. Yes Tom, I made it all the way back to Ontario riding the Spider with no rain. These Boondocker Hosts were wonderful, friendly, kind and just plain old amazing folks! We had 50 amps and water end even though we didn't use it they had a sewage dump nearby. Where we stayed on their property was well away from their home making for wonderful privacy for us. We went to church with them on Sunday after finding out we had that in common. We were so blessed by the Worship there and are very thankful to them for inviting us. We ate dinner with them our last night and enjoyed several hours of fellowship and eating! They are truly a great couple who love RVing like we do. If we are ever back in that area we will definitely be back there visiting with them. There is a lot to do around the area and they will be glad to share all that info with you. Our family of 8 stayed on Tommy's property for a few nights and he was such a wonderful host! The location was great and Tommy went above and beyond in accommodating us. We were very blessed to have had him as a host.